​The original Erie town company was formed in November of 1866 and the town was incorporated by probate court in December of 1869. At that time the Catholic population of Erie was fairly scarce. In the early years Catholic’s from Erie and the surrounding area attended Mass at Osage Mission where Fathers Schoenmakers, Ponziglione and other Jesuit Priests administered to their needs, even before the Osage left our area. Starting as a Mission Parish. The first actual recorded Mass said in Erie was in 1914 and St. Ambrose was made a mission parish of St. Joseph, South Mound, Ks. The following year 1915 the first priest to serve St. Joseph and Mission St. Ambrose was Father Francis Maguire. There was no Catholic Church in Erie, and Mass was held in rented space in a store building on East Third where a chapel was set up in the Dr. Steinburger building until 1924. First Catholic Church at 3rd and Grant. ​In 1924 the local Presbyterians offered to sell the Catholics their church which was originally built in 1897. The diocese purchased it in February, 1924. It stood on the corner of 3rd and Grant where the former Ewan Motor Co. used car lot sat for several years. It was dedicated under the invocation of St. Ambrose, by Right Rev. A.J. Schertner on June 13, 1924 with a solemn blessing by the bishop. Solemn High Mass with Father Bernard C.P as celebrant assisted by Rev. Fathers Alban Norbert and Bertrnad. The dedicatory sermon was delivered by very Reverend Father Anselm Secor, C.P. Rector of the Passionist from the Preparatory College of St Louis, Mo. and who was formerly in Charge of the congregation at Erie. ​Father Secor understood the conditions in Erie; dwelling on the fact the dedication of the Catholic Church was a blessing to any community in so far as it marked the progress of religion, a most potent factor in good living and real genuine citizenship. He emphasized the thought that neither force nor law can make a man or woman good and honest, but that this gentle powerful influence of religion is essential to train the conscience in the ways of virtue. In September, 1947 parish member Vivian Hoagland saw an ad in the Kansas City newspaper listing old military buildings for sale, The pastor ordered an army building 16x48 from Delta surplus building company in Kansas City, Mo. for a cost of $365.00 plus freight. It was to come from Louisiana, but after a six month delay they were sent one from Mississippi which was a better building. In October, 1947 a large tree was removed to make room for the new parish hall to be placed south of the church. The foundation was dug in October, 1947 by men of the parish and the forms were put in by Mr. Williams, pastor of the Erie Nazarene Church. Three cubic yards of concrete were purchased from a firm in Chanute. The concrete walk from St. Ambrose Hall to the front walk was constructed in the fall of 1948. Rev Van Williams of the Nazarene Church again did the work. ​From 1918 to 1950 and again from 1970 to 1982, the Passionist Fathers from the Monastery at St. Paul ministered to the Catholics in and around Erie. They were Fathers Anselm Secor, Julian Hyacinth Cleary, George Jungles, and Bertrand Norbert McGovern, Andrew Ahler, Romuald Huber, Gaveriel Sweeny, Agatho Donnelly, Cyprian Frank, and Robert Borger. 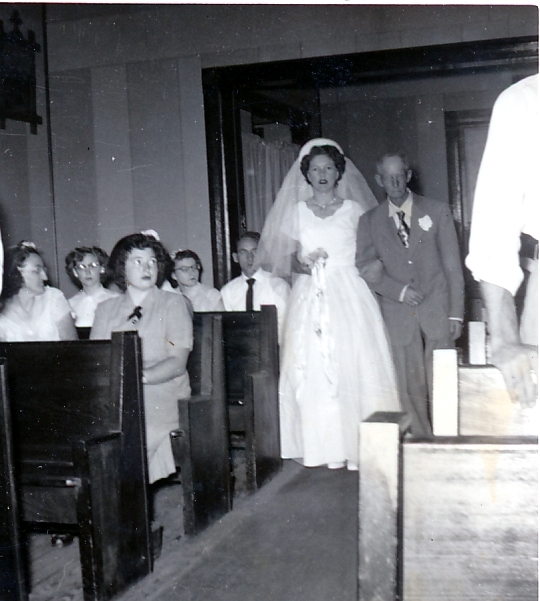 A native Son of St. Ambrose, James Hoagland, was ordained in 1957; his mother Vivian Hoagland was our long time organist. Organists following Mrs. Hoagland were, Anne Forsyth, Mary B Smith, John Melching, Dorothy Blain Catherine Fasken, Nancy Greve, and Jennifer Salazar, Lois Carlson has served as choir director since 1997. A New Church and Elevation to Full Parish Status! ​Marking the 50th Anniversary in 1964 the parishioners of St. Ambrose rejoiced in the elevation of their mission parish to a full parish status and St. Joseph, South Mound became the mission parish. 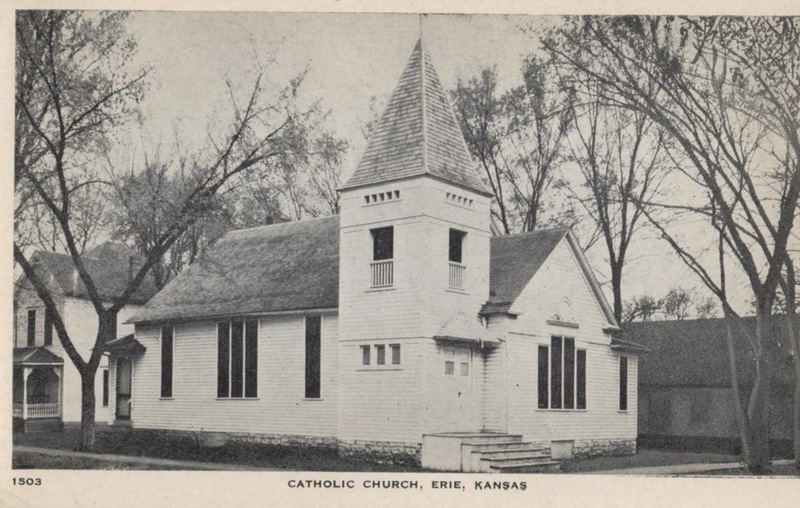 Bishop Byrne dedicated the new church and rectory in May, 1964 at 519 N Main, Erie, Ks. The Pastor at the time was Father Thomas McGread . Following the dedication Mass an open house was held at the church explaining the various aspects of the church to the public. Debra Holland infant daughter of, Woodrow and Patricia Holland was the first baby baptized in the new church, Father McGread blew the dust out of the font before performing the baptism. St Joseph Church, South Mound was closed on June 27, 1985. ​More recent improvements to the church include; installation of a marble altar donated by the Sisters of St Joseph, Wichita and new stain glass windows sponsored by the local parish families, and a new organ and refurbished pews under the guidance of Rev. Daniel L. Vacca. The parish celebrated 100 years in 2014 and 2015. A Modern, Well-Appointed Parish Hall. In 1985 construction of a new parish hall was started. 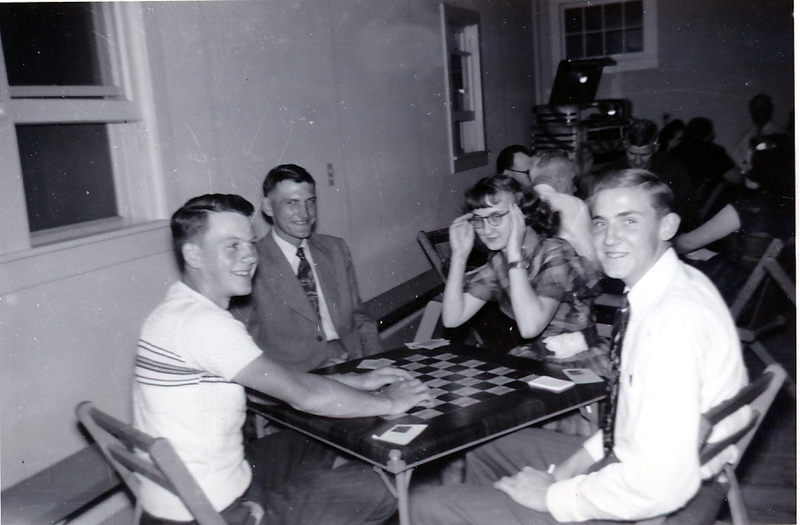 The new hall, located just west of the church, included a spacious dining room and a well-equipped kitchen with two multi-purpose meeting/class rooms as well as storage and restroom spaces. Bishop Eugene Gerber performed the dedication honors during the weekend of a pastoral visit March 1986. Father Smith and Parish Council Perform Groundbreaking for Parish Hall in September of 1985. See the note at the bottom of the St. Ambrose home page for information about Father McGread’s extensive work with Catholic stewardship. Historical photos on this page were provided by the Erie Historical Society (Mem-Erie) The photo of the existing St. Ambrose Catholic Church was taken by www.stfrancis-stambrose.org.